Want more marketing ROI? Give your sales team more visibility. It’s not that our business development team doesn’t want to help with marketing initiatives. It’s just they spend their days juggling. They need to call and email and schedule and nurture and manage the seemingly unmanageable amount of activities that come with prospecting at a fast-growing startup. On top of carrying out marketing requests. Don’t get me wrong: When I ask the team to make sure they pay special attention to leads from a certain webinar or conference, they do. But then it’s all too easy after that initial touch to add other “special attention” follow-ups to their to-do list – because there’s still all that calling and emailing and scheduling and nurturing and managing to worry about. My love affair with visibility started because of speaking abstracts. We at LevelEleven know that at our biggest conference of the year, the prospects who attend one of the sessions where our customers share a case study often become the most qualified opportunities. As part of last year’s conference prep, I asked the sales team to get me client meetings – just a quick call, so I could find out if that person would be up for speaking at the event. They got me eight meetings. This year, I had the email drafted. It detailed how case study sessions help business and asked for active outreach from the sales team. Before I hit send, I realized this note would likely be followed by one asking for a pipeline update or preceded by one reminding of an internal product update. It was yet another request. I deleted the draft. Instead, I built a week-long campaign. Team members got points for every meeting they booked between one of our marketing team members and a customer to discuss conference speaking. I used LevelEleven’s sales performance platform to automate the campaign, but the point remains the same: It was all about visibility. Team members saw leaderboards on monitors around the office, received emails, got mobile updates and viewed real-time pop-ups in Salesforce, our CRM. They were surrounded by the conference speaker campaign. All of this added visibility led to a natural increase in recognition for those signing up customers to speak and collaboration between all team members on what was working. It also resulted in 31 meetings. That’s a 388% increase that simply came from keeping this initiative in front of people. The great part? Within a week of the big conference, we already had two deals closed from prospects who attended the sessions that conference speaker campaign produced. I took the same approach last month with LinkedIn. We know that leads coming in from this channel are high quality, so I ran a campaign where the business development team got points for scheduling demos with LinkedIn leads over 10 days. We saw a 385% increase in conversions from LinkedIn leads to opportunities. One thing to note about the LinkedIn campaign is that there were only three business development managers involved. And they’re not competitive. They used the leaderboards as guidance in developing daily goals with each other around these opportunities, and then they worked to achieve them. 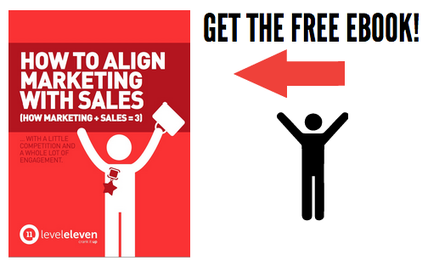 Misalignment between sales and marketing has become accepted and somewhat expected. But in many cases, the solution can start with keeping your entire team focused on what matters — with simply helping them to understand, rather than assume, which of those activities that they’re juggling deserves focus. Such visibility will keep your marketing campaigns realizing potential, so you can keep growing your business. Sometimes aligning sales and marketing for more marketing ROI is just a matter of increasing visibility around crucial metrics.